This beautiful Hexagon Blues crocheted ottoman is guaranteed to bring a homey and warm feel to your abode. The cozy crocheted piece will brighten any room! Make it in your favorite color for a personal touch! In fact, crafters with advanced crochet skills will definitely enjoy working on this lovely project. Once completed, the crocheted ottoman should measure approximately 13.25 inches wide by 13.25 inches long by 13 inches high. In metric units, the finished crocheted piece should be about 33.5 cm wide by 33.5 cm long by 33 cm high. This crochet pattern is a wonderful design by Tammy Hildebrand. In fact, you can access the FREE downloadable pattern for this cozy crocheted ottoman cover from the Red Heart website. 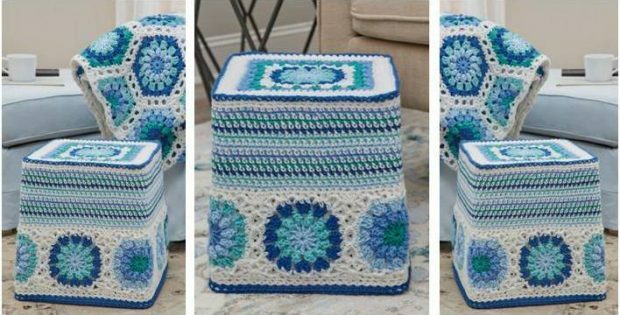 To access the FREE downloadable pattern for this comfy crocheted cover, please click on this link: Hexagon Blues Ottoman Pattern.